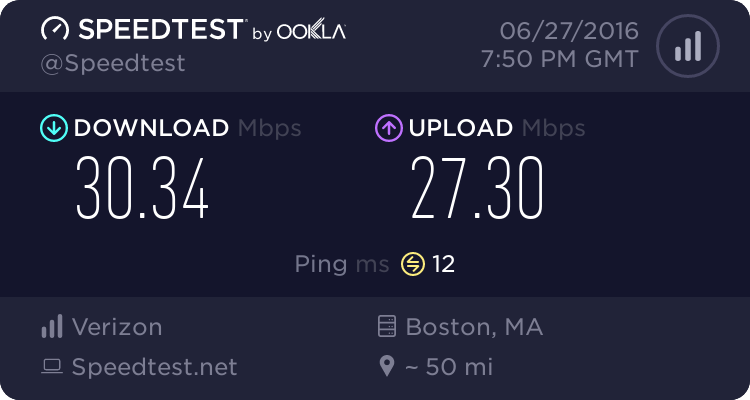 TCCoA Forums > Other Stuff > PC Stuff > Internet speed test WOW! Put it to good use tonight. 24 GB in 11 minutes? heck yeah. Last edited by ShadowDragon; 11-09-2015 at 09:17 PM. Don't you want to thank GOOGLE for making this possible? BTW, which router did you upgrade to? Actually it was all in progress in 2012 and the first public announcement in 2014 as they were about done with the two biggest markets. The Carolinas is the third so it was started early 2014. It actually takes quite a bit of time to completely upgrade every single hubsite across two states to DOCSIS 3 compliant equipment, and replace any old copper along the way. No-way it can be done in a couple months like the click-bait sites think. Just like Y2K was being worked on at least a decade before the Media got ahold of it and made things up pretending it was something new. I bought the ASUS RT-AC68U. So does this mean you'll spend more time on Fallout 4 than you will here on the forums? If so, I understand, lol. Actually it was all in progress in 2012 and the first public announcement in 2014 as they were about done with the two biggest markets. The Carolinas is the third so it was started early 2014. It actually takes quite a bit of time to completely upgrade every single hubsite across two states to DOCSIS 3 compliant equipment, and replace any old copper along the way. No-way it can be done in a couple months like the click-bait sites think. Just like Y2K was being worked on at least a decade before the Media got a hold of it and made things up pretending it was something new. Ok, so the writing has been on the wall for some time. Either way. I'm glad the increase is here and it's not supposed to cost any extra. I actually stepped my plan down to the 200/20 level and saved quite a bit of $$$ over the course of a year. It's still 4x faster than what I had before. I just don't need 300/20. 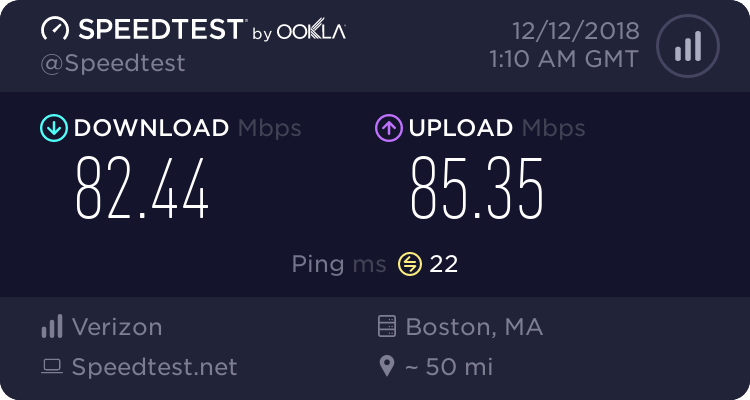 New router from Verizon, a little better! We got fiber here a couple weeks ago I think. 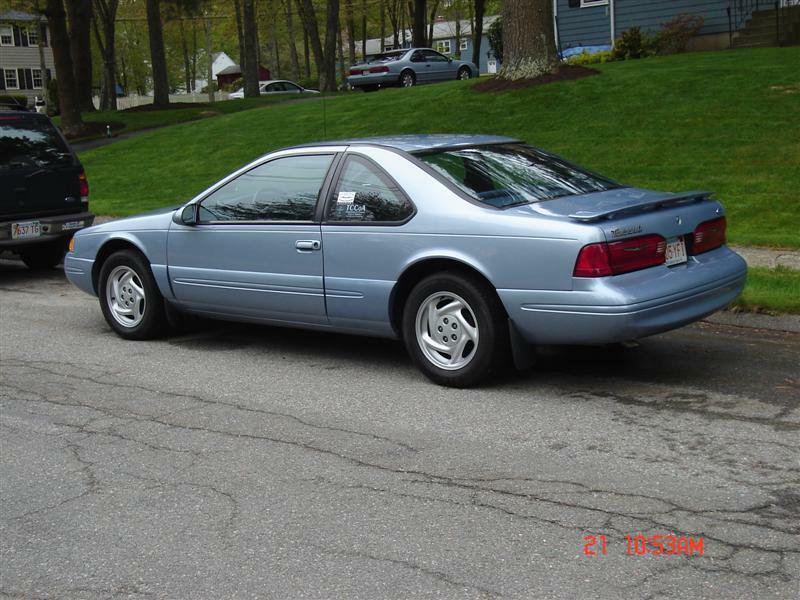 1994 Thunderbird - 2000 4.2L M5R2 now on the road!! 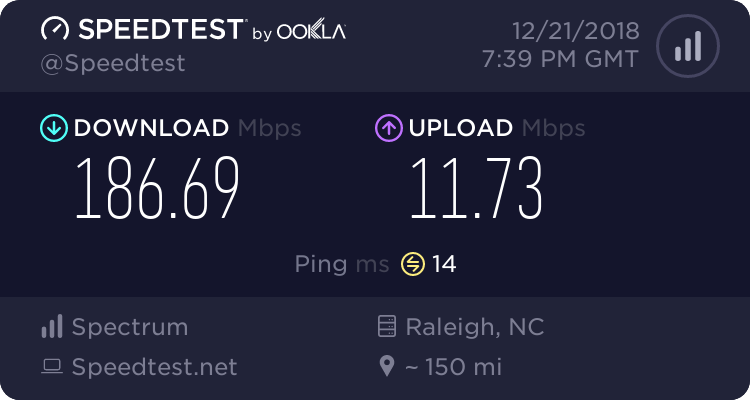 Tried it again, the upgrade with the new router might have kicked in. You know better than me! Last edited by Trunk Monkey; 01-17-2018 at 08:49 PM. What's promised, what's tested and what I get in real life day to day usage are NOT the same. Hmm, seems a little unbalanced. Tried it again tonight. I' supposed to be getting 200 down. Are you testing straight from your Cable Modem, or from a router/wifi device? If you're testing from a router/wifi, they don't always have the capacity depending on age, function, etc to push full bandwidth. Also, any other users on at the same time can be pulling some of the bandwidth as well. To do a speed test to see if you're getting proper speed, do it with your computer plugged directly into the modem provided by the internet provider, with nothing else in between. That will require a reboot of the router if it is already married up to a wireless router. Testing from my router. The thing is, I have not changed my set up since I recorded the results below. 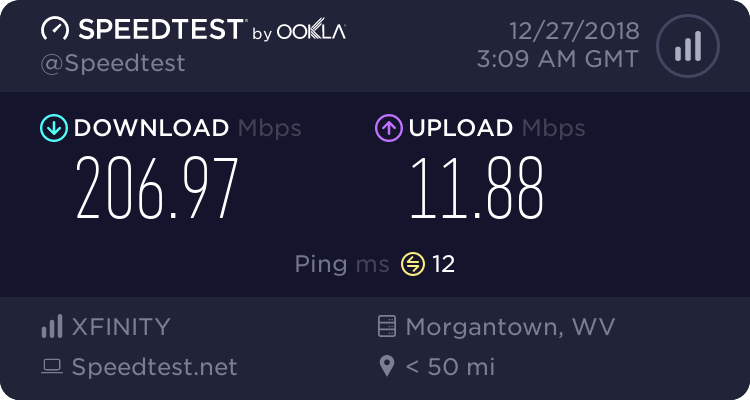 The only thing that I changed was my agreed upon bandwidth with my ISP from 300 down to 200. I spoke with them today (about lowering my bill) and discussed the results above with them. They provided one of their modems that I'll try installing tomorrow. If there's still no change they said they'd check my settings remotely and/or send a rep out to look at things. Last edited by Trunk Monkey; 12-21-2018 at 01:41 PM. Funny how the faster you are the slower you die gaming. I'm fast at dying. Gave it up for YouTube actually. 1992 Tbird LX 5.0, 3.73 gears, 1995 Cobra intake, deleted air silencer, 2.5" mandrel bent dual exhaust, SCP shorty headers. Updated four-hole fuel injectors. SK shift kit in AOD. Vogtland 0.9" springs, Tokico and Bilstein shocks. My work. It's kinda pathetic. Then again, our broadband is managed by another department within my organization. 1. We have 24,000 employees....of which, I expect around 17,000 of them to be at a desk at least 50% of their shift. 2. My department only has 400-ish users at the site I'm located. 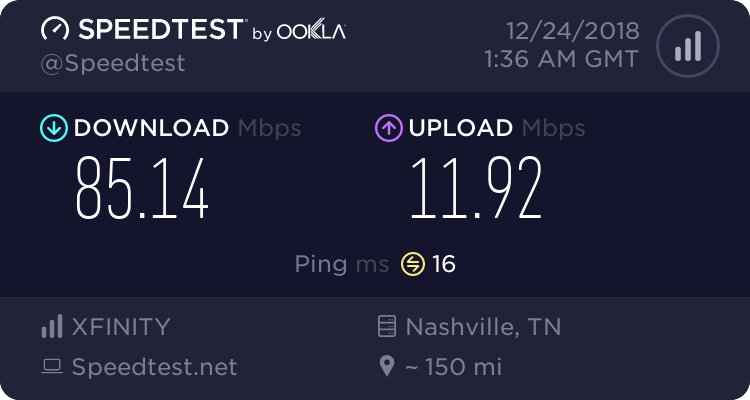 Verizon email today telling me they gave me a complimentary speed upgrade! This story caught my eye recently. I'd imagine that New York isn't the only place this is (or was) going on. 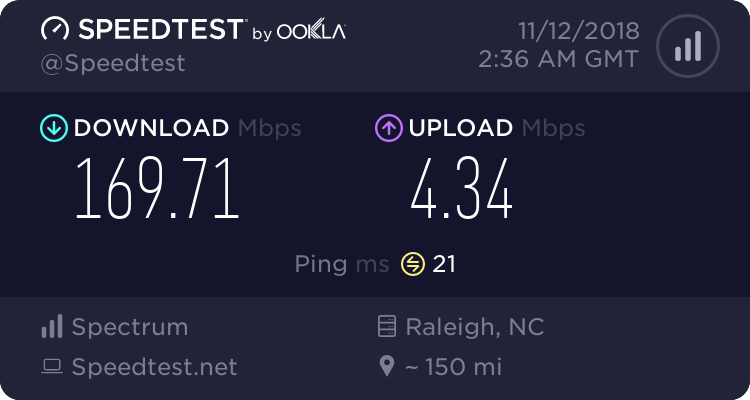 I've noticed a drop in my promised speeds too since Spectrum took over Time Warner. I ran the test again today and got the following results. I "should" be receiving 200/10. 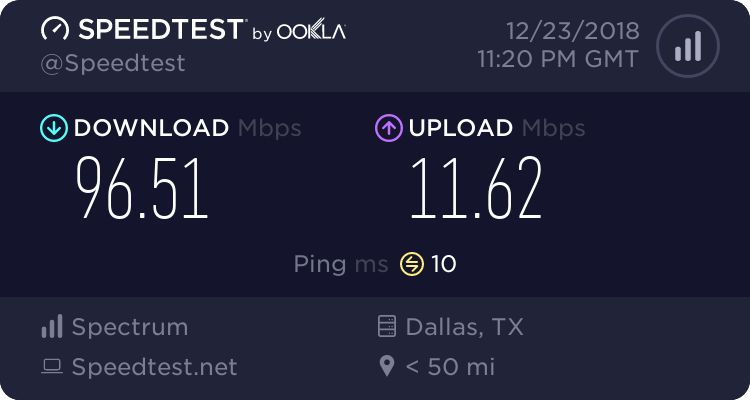 Spectrum dropped my upload speed from 20 to 10 without even telling me. I found this out after swinging by the office one day to inquire what was up. Last edited by Trunk Monkey; 12-21-2018 at 07:28 PM. Interesting results for me at home. 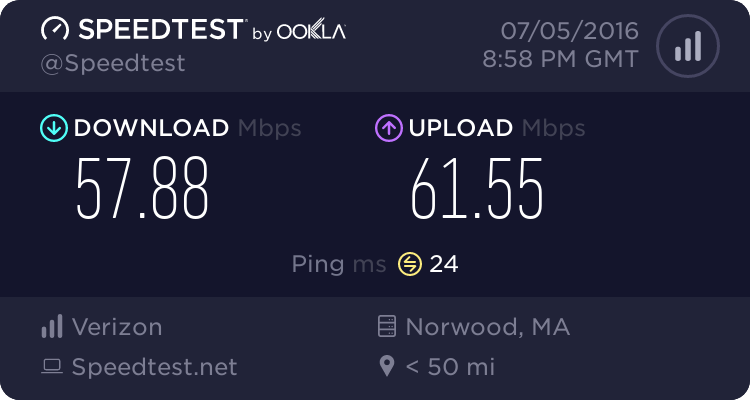 I have 100/100 FIOS service at home, but between my laptop and my phone, I get dramatically different results. The attached image is from my phone. 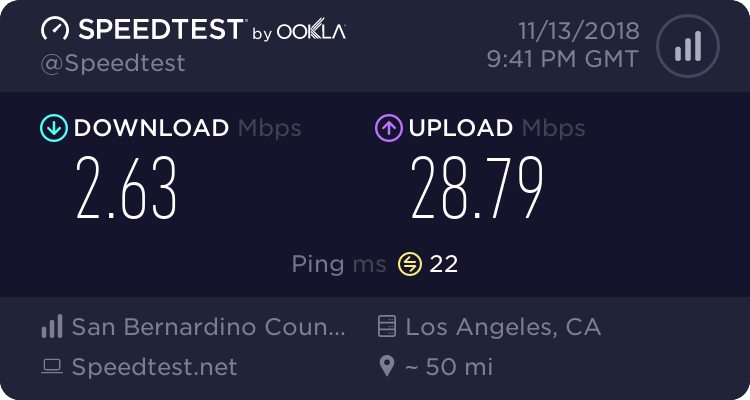 It briefly peaks at over 100Mbps on the download speed, but then tapers off to the mid 70's Mbps range by the end of the test. I have no computers that are wired for me to test, so I don't know what those speeds would be. 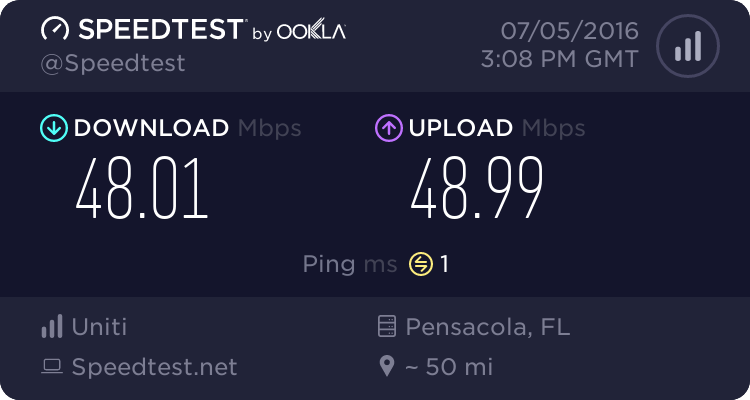 I'd imagine they'd be right at 100/100 Mbps +/- 10Mbps on both. I've been meaning to post this for a while but just now got around to it. 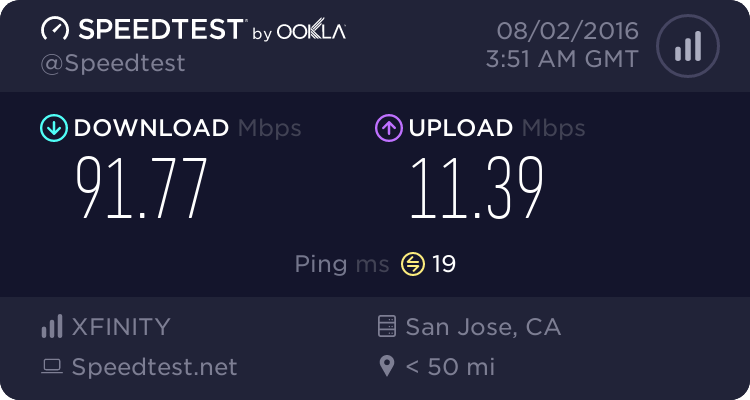 Of all the overpriced stuff you can get in SF ($3300 1bedroom apts, $5 toast, $20 cocktails, $8 beers), one item that is actually a good deal is fiber-to-the-home for ~$62 bucks all-in from Sonic. You have to pay more taxes than you would with Comcast because they also bundle phone service with international calling to a bunch of countries (which I've never actually used in the year I've had Sonic - the phone or the long distance) but despite "wasting" my money. The reason this smaller ISP can be competitive in SF is because SFGOV passed a law that lets them actually string fiber to the home (FTTH) on the same poles that PG&E uses. Coupled with the fact that you can now mechanically splice fiber with minimal signal loss without a really expensive fusing machine means an enterprising ISP can come into a neighorhood with their trucks before the big boys and offer way better service for a reasonable price provided you sign up within a set timeframe (like a month or so). I chatted with the guy running the cable and basically, it's one fiber line down the street and then they bring one contigious fiber line into my house spliced into the line on the pole. This terminates into a small CPE device that gives me a gigE port + POTS RJ11 port and I'm cookin'. Dude, that's awesome! Kinda jelly of your speeds....not of your cost of living though, lol. Yeah, I know I live in a bubble. I wish more of my neighbors/elected officials would realize just how different SF is from the rest of the country (or even the rest of CA) for example. You find all sorts of weird stuff everyday -- like how SF & Berkeley decided that since too many minorities are forced to repeat Algebra in middle school, they will flat out just NOT offer it to students even if they are ready until HS. This forces those kids who want to go to competitive colleges (esp for engineering) to double up on Algebra & Geometry in HS just to be able to take Calculus by their senior year. The alternative is to go private to the tune of $20-35K A YEAR. While I suspect this (algebra in middleschool) might change by the time it becomes relevant to my preschooler, the fact that such a rationale made sense just blows my mind. On a lighter note, here's another odd thing I encountered when I first moved to the bay area back in 2004. Upon moving here from TX, I was shocked to find out that where I lived at the time (north San Jose), I couldn't even get cable internet. I think I was forced to use 5mbps DSL @ $40/mo for nearly 2 years until I moved to SF.